These classic apothecary jars are sure to put a smile on your guest's faces when they are filled with treats of your choice. Customize with a unique metallic gold or silver label for an exquisite finish. Offer your guests a fun favor when you fill these classic jars with cookies, candy, decadent chocolates, honey, fudge, spices, baths salts, herbs or other delightful treats of your choice. The apothecary jars are made from glass and have a 10oz capacity. The jar has a hinged top with a rubber gasket and a metal closure for an airtight seal. They come bulk packed in bubble bag egg crate box. 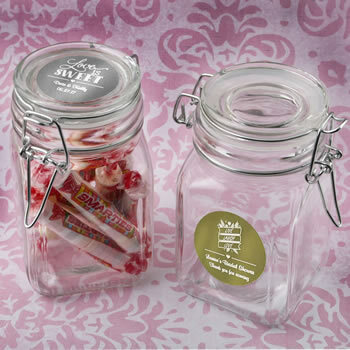 The top lid of the jar is the perfect place to put your personalized gold or silver metallic label. Our high-class metallic gold or silver foil stickers can be printed in white or black print. Use our exclusive Design Tool to preview and design your own 1.75" sticker choosing from a large range of themes, designs and styles to suit any special occasion. View your creation online before placing your order. The personalized labels come on easy peel and stick sheets.